On non-defective machines, purchaser needs to pay return shipping costs and 10% restocking fee. Lifetime frame warranty, 6-year parts warranty, and a 3-year labor warranty. The NordicTrack Commercial 14.9 Elliptical is a high quality fitness machine which offers all the latest technology along with commercial gym features. This front drive elliptical has a heavy flywheel which uses magnets to give you many levels of silent resistance. Both the incline and the stride of this elliptical is power adjustable with a push of a button. The console has a large 10" touch display from which you can use iFit to create your own route on Google Maps for workout routines which also can use Street View to show your location as you work out. The display is ideal to surf the internet if you rather watch videos or read as you exercise. This elliptical is shipped with easy assembly in mind and requires significantly less steps to put together than other similar ellipticals. 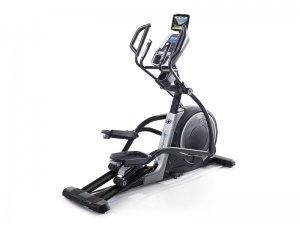 This NordicTrack elliptical has an average size of 64.5" long, by 26" wide, and 80.25" high. It has a 32 lb effective flywheel that gives you up to 20" power adjustable stride length. This elliptical can also adjust the incline of your stride up to 20 degrees with just a push of a button. The foot pedals are padded and are easy to maintain traction and control while peddling. The pedals also have 3 options for adjustment of your heel to toe angle. The NordicTrack Commercial 14.9 Elliptical with it's stiff steel frame has a user weight limit of 250 lbs. 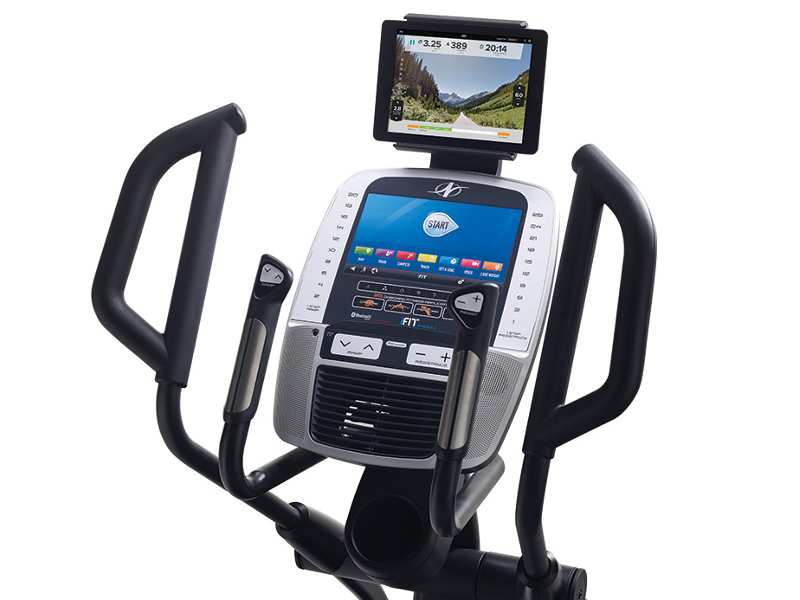 The centre console of the Commercial 14.9 has a 10" color touchscreen which allows you to interact with the elliptical, surf the internet and use iFit for workouts and to track your fitness activity. It also has stereo speakers which you can plug via usb your mp3 and iPod player. Below the program and workout controls on the console you have the Autobreeze Fan which can adjusts it's speed depending on the intensity of your workout. The center grips that come out front of the console have controls for volume and resistance along with dual heart rate monitors. A chest strap is also included which you can use instead. This elliptical also includes a holder for your tablet along with one for your water bottle. To get on this elliptical hold the upper body arms of the elliptical or the handlebars (with the heart rate monitors in front of the console) and then step onto the pedal that is in the lowest position. You then can step on the other pedal. Once you are on the elliptical you can start to push on the pedals to get the flywheel spinning. When this happen the console will turn on and light up. The touch screen works similar to other tablets and you operate it by pressing your finger on the screen and swiping when required. When the elliptical starts it will be in manual mode and you can change the incline and the resistance as needed by pressing the appropriate buttons. To use one of the built in workout programs you just need to touch the runner button at the bottom of the touch screen. From here you can follow the prompts to select the workout you want. When you have finished your workout before you dismount from the elliptical make sure it has come to a full stop. It may take several revolutions of the pedals to do so. This NordicTrack elliptical comes with 35 workout programs built-in. Everything is easily accessible from the touch screen. To start you press the runner button to bring up the workouts menu. You then select the workout category you want and then select the workout from within the category by selecting it on the screen. Along with the name of the workout it will also display the duration (except for the set-a-goal workout) and approx number of calories you can expect to burn. A profile of the incline and resistance of that specific workout will also be displayed. All workouts are broken up into segments. Each segment equals a block of time, a resistance level, and an incline level. Once you have completed all segments the workout is over. Each workout also has a target zone meter which is intended to provide motivation and keep you maintaining a certain speed of pedaling. This target is displayed as revolutions per minute (rpm) and when maintained will help you meet the target calories burned for that workout. The NordicTrack Commercial 14.9 is iFit enabled. To use all the features of iFit, it requires a subscription from iFit.com for just under $10 a month. Some features of iFit are free (requires iFit account) to allow you to figure out if it is something you would like to continue using. This technology enables your elliptical to communicate with your wireless network to iFit.com. With the iFit app built into the Commercial 14.9 you can download personalized workouts and create your own custom workouts. You can even create workouts based on Google Maps and as you work out your route will be shown on a map along with pictures from Google StreetView showing your progress. iFit also tracks your workouts so you can keep track of calories burned, etc. Shipping is free for the Commercial 14.9. This elliptical is shipped partly assembled and only requires a few steps to complete the assembly and set it up so you can start your first workout. If in stock you can expect to receive this elliptical from NordicTrack in roughly 14 days. The NordicTrack Commercial 14.9 elliptical costs $1,699 USD and comes with free shipping. * All prices are in USD unless specified other wise. Prices, coupon codes, products offered, and product features last checked . This elliptical comes with a 30-day money back guarantee. If you are not satisfied with the Commercial 14.9 within these 30 days for any reasons you can return it for a full refund minus a 10% stocking fee and the cost of the return shipping. Defective machines can be exchanged or returned for the full purchased price. The NordicTrack Commercial 14.9 elliptical has a lifetime frame warranty, a 6 year parts warranty, and a 3 year labor warranty. Preventive Maintenance Service Plans and Standard Service Plans are available for additional cost which can give you up to 5 years of additional protection on your elliptical. Costs range from $29.90 to $489.99 depending on the plan. NordicTrack customer service during business hours can be contacted via a toll free phone number and online chat. You may also send customer service an email or use the online contact form. Manuals in pdf format can be downloaded from the NordicTrack support site and you can read the answers to commonly asked questions which can be found in the FAQ. On the support site you can also register your elliptical and order parts if needed. A link to elliptical maintenance videos can also be found.